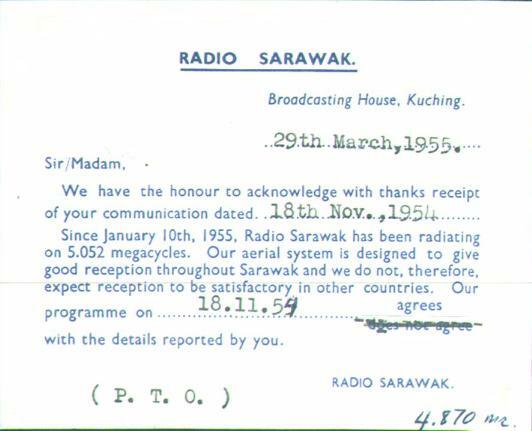 QSL cards from Radio Sarawak in Kuching for report of 18 Nov. 1954 on 4.870 mHz. and from 6 May 1955 on 5,052 MHz. Power was 5000 watts. Sarawak occupied the northwestern part of the island of Borneo. It was a sultanate under the British Brooke family and a British protectorate until 1946. At that time, the Brooke family ceded the territory to Great Britain and it became a crown colony. In 1963, Sarawak joined Malaysia. Borneo also includes three other political entities, Malaysian Sabah, Indonesian Kalimantan, and the independent sultanate of Brunei.